“Deaf President Now Protest,” Histories of the National Mall, accessed April 23, 2019, http://mallhistory.org/items/show/509. 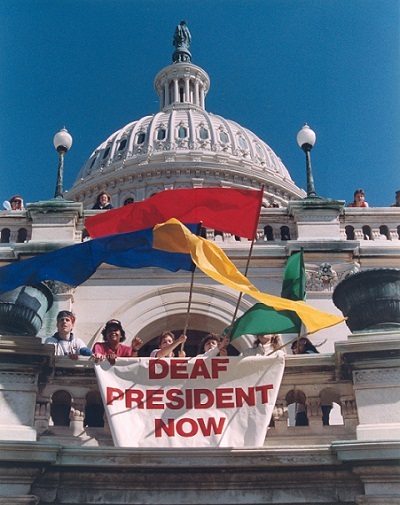 On March 11, 1988, deaf students from Gallaudet University in Washington, DC marched to the steps of the Capitol protesting the selection of Elisabeth A. Zinser, a hearing person, as the University's 7th president. Student leaders directed the crowd in a chant that demanded a "Deaf President Now.” Protesters carried a banner that read “We still have a dream!” Faculty, students, and deaf community members attracted national press attention and closed the campus for a week-long protest. Due to the outcry, Zinser resigned and I. King Jordan became the first deaf president of Gallaudet, the world’s only university designed specifically for deaf and hard of hearing students. Courtesy of Gallaudet University Archives. View Source.